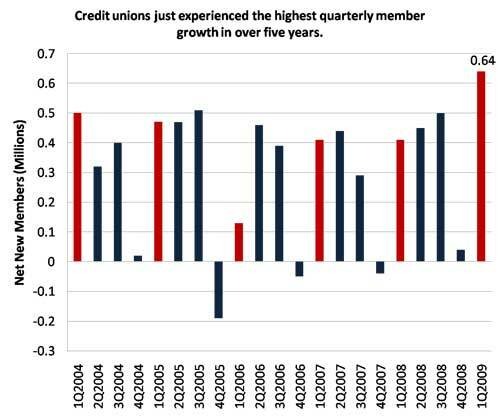 Credit unions experienced the highest quarterly net member growth in 5 years, likely resulting from two recent developments in the current economic crisis. While the economy seems to have avoided total meltdown, people are still being laid off, homes are still dropping in value, and the road to recovery will clearly not be quick or easy. The negative economic environment over the past year clearly didn’t provide ideal conditions for many businesses to flourish. Even though the credit union industry hasn't emerged unscathed from this recession, it has fared better than our bank and thrift competitors – look no further than the industry's most recent growth numbers. The enormous amount of negative national publicity the banking industry has received is leading consumers to explore other options. First quarter data indicates that more of them are turning to credit unions. 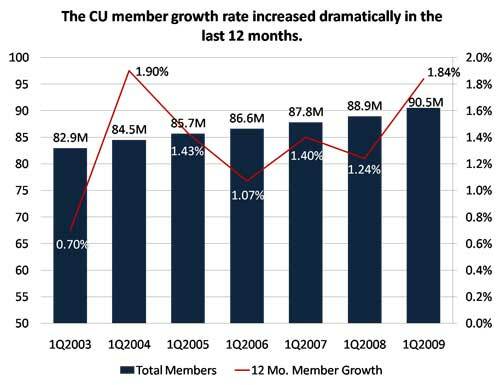 As of March 31, 2009, the number of total credit union members swelled to over 90.5 million, growing 1.84 percent since March 2008.
Credit unions historically attract the highest number of net new members during the first quarter, while typically gaining the least during the fourth quarter, as many institutions purge inactive members from their books. Even compared to previous first quarter membership gains, 1Q 2009 member growth is the highest in over five years, primarily concentrated in institutions over $20 million in assets. Not only is more of the public finding their way to credit unions, but existing member relationships are deepening. The average member relationship across the industry increased to $14,127 at the end of March, growing 5.1% in the last twelve months, the highest rate of growth since 2006. It is encouraging to see the average credit union relationship expanding at the same time as total membership, because this indicates that new members are using a significant breadth of products and services. 1. Customer dissatisfaction with banks is prompting consumers to actively look for other options. Financial services have perhaps been affected more than any other industry by the current economic crisis. The banking industry in particular has been slammed with extremely negative headlines, heated criticism, and even potential insolvency for some of its largest institutions. Bank and thrift customers were, and are, being directly impacted, as banks have significantly tightened lending standards and reduced the availability of credit, cut back on services, or experienced hastily-arranged and well-publicized mergers. Credit union member growth is most likely coming from people who are either fed up with their current institution or those that find their way to a credit union seeking to obtain a loan in a marketplace where credit availability is scarce. In fact, the average educational and promotional expense per each net new credit union member reached its lowest point in over five years -only $323 for the 12-month period between March 2008 and March 2009. This is particularly notable because the figure was approaching $500 only one year earlier. Several factors contributed to the dramatic decrease. Two-thirds of the industry decreased education and promotional spending over the past 12 months, and the total industry expense is down 9.3 percent from March 2008. This comes as no surprise, as this expense is often one of the first to be trimmed in the budget when credit unions look to cut costs. Despite a widespread decrease in marketing budgets, credit unions are attracting more new members simply because they continue to reliably serve their members and conduct business as usual - an outstanding quality in the current turbulent financial services marketplace. 2.Credit unions are actively seizing upon a market opportunity. Even though the majority of credit unions cut back on direct marketing expenditures in the past year, many view the current environment as a historic opportunity to reach out to new potential members and have aggressively stepped up their promotional efforts. Many credit unions are actively leveraging consumer dissatisfaction with banks and thrifts to emphasize what makes them different from other financial institutions and get their unique message out to more people. Credit unions like Arizona State CU and Florida Commerce CU are creating a buzz with community resources aimed at helping distressed members get back on the right track. Others, such as HarborOne CU, are emphasizing their local roots in advertising campaigns, or using new segmentation techniques to better ensure that their message reaches the right audience. Many are taking their message directly to the airwaves by creating new media partnerships, with several groups, such as the Credit Unions of Washington, finding that they can effectively communicate in a collaborative voice across a state or region.